This is a project that I’ll watch with great interest! There are a lot of PVC hardfoam boards in my man cave, waiting for my attention and I am curious about the plastic bug screen? Is it a semi-flexible or even hard mesh or more something soft like a cloth? 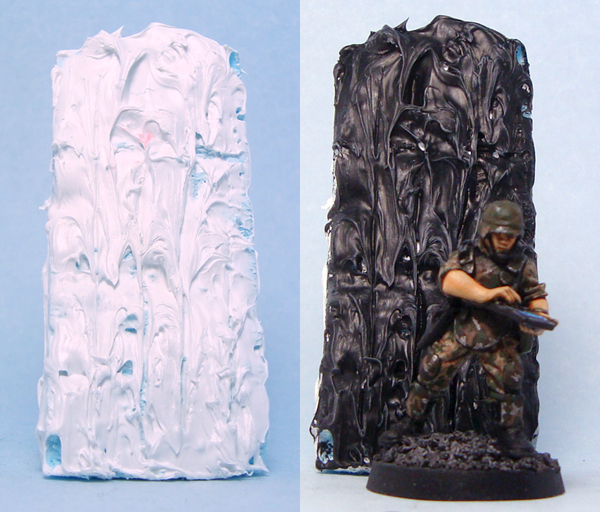 It does appear to be pretty firm (in the mantic base picture) and hasn’t lost it’s shape. I had thought about using a wire mesh, but this would be too expensive and I really don’t see myself casting several hundred floor tiles from dental plaster. My latest idea isn’t that much cheaper. Thanks for the comment, Oliver! The bug screen is quite flexible, the thickness of a thick sheet of paper. It’s very durable – doesn’t really tear – but can be cut easily with regular scissors etc. Hope this helps! The Mantic bases with the grating on them is a fantastic idea: simple, effective and cheap. Consider that stolen for sure. Using the paste for the hive wall sections has potential I think. The thing is that the Alien designs tend to be less random and more structured: a bit mechanical I suppose. The current wall looks a little too random for my tastes, but if the walls were broken up at regular intervals with something else (some sort of organic pillar?) then it might well be fine. Maybe making some sort of tool to rake or comb the paste after application would add a hint of uniformity while still giving the gunky slimy look. I have one other suggestion, that might sound a bit mental but bear with me. My initial reaction at the time was to scoff loudly, but he managed to make it work and I had to eat humble pie. He may have cast one section of wall and replicated it, I cant remember for sure. He was working in a different scale, so I dont know if it could be pulled off in 28mm. But its food for thought. Literally. Of course you could also use some sort of ridged flexible piping from the hardware shop to break up the walls with something similar to the vertical cabling in the photo in my previous comment. Thanks for the comments. I did some reading on the bone thing – the idea actually came up on TMP a while back. Experts suggest that if you just boil the bones, you end up sealing loads of fat in the bone. I’ve no idea whether this would cause problems later. I think I’ll take a look at hardware stores first, but I’m not going to dismiss the bone idea. After all, what better way to create an organic look than using something organic? 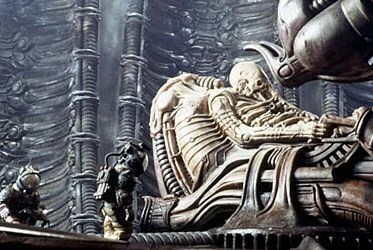 I’m a big HR Giger fan myself, and I think it would be a pity to miss out on an opportunity to make some really cool terrain. Sure it will take some extra time, but I think in the end it will be worth it. Thanks for the feedback, I actually bought some electrical wire yesterday. I’m going to use it add some regularity and structure to the whole thing. Let’s see how it turns out! For making walls and sloped out croppings It sould be possible to use some of that or the ribbed black tubing that they use for appliances and fish tanks. Secret weapon miniatures has some excellent infested bases if you are for stuff that has a very alien like growth on it. I had a chance to read through some of your older posts in regards to the various model scales and it’s been very helpsful, I really like the jungle table you were previously working on. Needs more plants though. I just posted a zombie game concept may like http://www.mechdudesblog.blogspot.com/ probably will run it as a modified Ambush Z game. I made a 3-d version a few years ago to use with the Leading Edge minis. 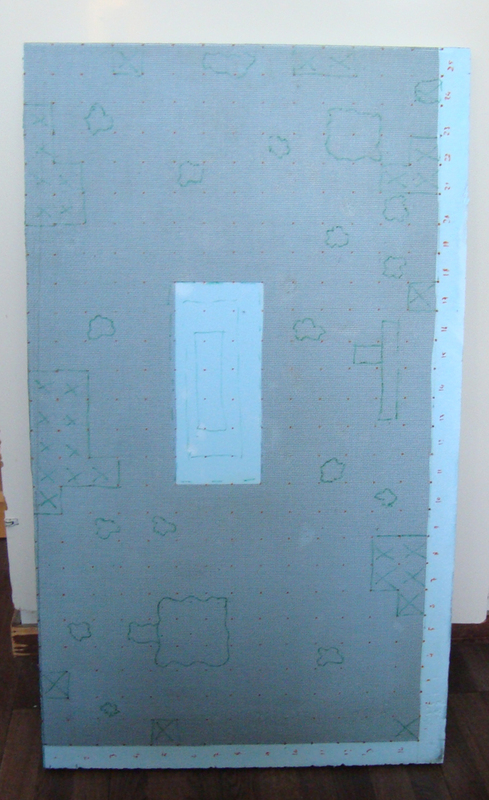 It was a bit crude (foambord floor, walls, and obsticles) but it worked and wasn’t too bad for a 1st run, lol. I still want to make a better version at some point, once I work myself up to it. I had used elmers glue and some white caulking for the “goo” stuff. I was thinking of the plastic mesh looking material from craft/sewing projects to use as floor grating, not sure how well it would fit together though. Looking forward to seeing your finished product. What do you plan to use as fire markers (for burning ground blocking)? Any plans for an area with eggs and cocooned colonists? Thanks for the comment Gary! For fire markers I’m planning to use smoke made from craft wool and possibly flames from one putty or another. Definitely looking to do some eggs and infected victims!